Show off your gorgeous artwork in a creative and exciting way with our contemporary three-panel wall art sets. A stunning feature for your home or inspiring decoration for the office, these framed multi-canvas prints bring any room to life. Available in 12 different sizes, there's a triptych canvas to suit any wall, big or small. 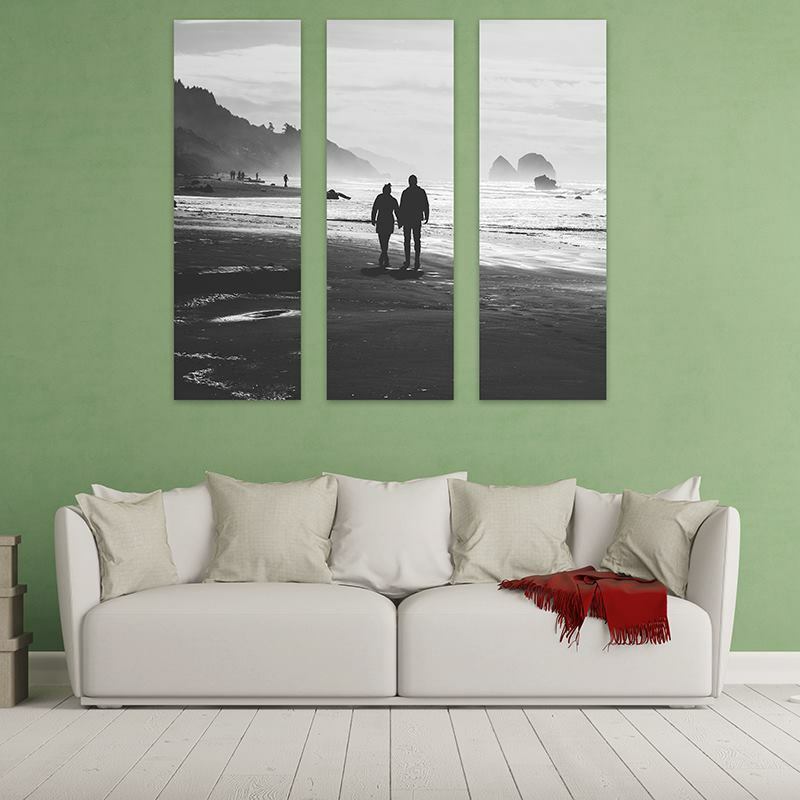 Whether you’re a photographer looking to display your art in a stylish fashion, or simply want to create a feature 3 piece for your living room, 3 panel wall art is your answer. Choose your pictures, painting or design and transform it into split canvas prints, giving your space a modern, fresh feel. Three-part set mounted onto a custom-made wooden frame, your triptych wall hanging is truly unique. I have ordered a Triptych canvas after much research, bags of love offered the best price. It was very easy to create and the delivery was fast and the whole process hassle free. The canvas simply looks amazing!!! Quality is great. Exactly how i've imagined it will look like. It's perfect and makes my living you so much nicer! Bags of love!! Fast production and shipping. Was delivered well packaged. Beautiful high colours and crisp image. Well made. I’m so happy with it. Triptych Canvas (90x40cm so three panels 30x40cm). Excellent quality product (which was a key factor me for). Well finished and good quality print. Delivered quickly and well wrapped. Don’t just treat one room to stunning wall art; buy two sets of triptych multi-panel prints and receive another set free. You can create three separate designs – simply add your first design to the basket then go back to create your second, and repeat! It's a triple 3 part deal. We use digital canvas printing to lock in the colour, then trim the fabric to size, mounting your split canvas prints by hand to the stretcher frames. We will mirror wrap the image to stop there being a white border around your print. This means that each edge of your canvas will have the image you have uploaded mirrored to wrap around the edges of the canvas. For artists and photographers, there’s the option to print your own website URL for reselling purposes, or if you’re buying this as a personalised photo gift, you can remove our Bags of Love website URL so they don’t know where you’ve bought it from. Recently got married? Treasure the special day and have your most-loved photograph printed onto triptych canvas posters. In full colour or artistic black and white, this is a unique way to celebrate the start of your married life together.